One of the things that I love with my morning cup of tea is honey with lemon. I began to notice that after a couple years of this relaxing morning pleasure, my incidences of allergy issues diminished. Honeybees are being sent around many regions of the country. The importance of this is not to be downplayed. These ‘workers’ have been able to pollinate about $40 billion dollars of the USA’s agricultural produce each and every year. We wondered why our trees had blossoms but were not producing fruit. We then discovered that in our area, bees were in serious decline. We learned that more then 130 fruits vegetables and fruits that we enjoy here in America, that are important for a diet that is healthy and important for well rounded nutrition, can be credited to those honeybees. According to the reports that we have read, there are commercial bees that are raised on bee farms, and sent to other farms to help with pollinating. The wild bees and the commercial bees are the responsible workers for the pollinating that necessary for about 80% of all the crops of food grown in the USA. We found articles, watching National Geographic and internet social media videos, and began to see that very few American’s are really aware of the impending serious nature of the decline and disappearing bee population across our nation. It appears that in the last five years from 2012 to 2017, about 30% to 40% of our national bee population are gone, and almost a third of all of the hives of bees here in the U.S. have according to experts….disappeared. Then we posed questions here at the “Concord Show,” and began to realize that just reporting on this concern was not enough. Many of us and our small support group of concerned citizens, felt it important to take steps. People in our close knit group read and educated ourselves. We turned to others in the group to brain storm and share the knowledge from reading and research. We started out with one hive and a few weeks later, a second hive. “With so much at stake, efforts to investigate and uncover reasons for this sudden global pandemic have been robust. A new government study blames a combination of factors for the mysterious and dramatic loss of honeybees, including increased use of pesticides especially in the US, shrinking habitats, multiple viruses, poor nutrition and genetics, and even cell phone towers. However, according to last year’s joint EPA-USDA study, the biggest cause is the parasite called the Varroa destructor, a type of mite found to be highly resistant to the insecticides that US beekeepers have used in attempts to control the mites from inside the beehives. Moreover, new virus species have been found in the US and several of these have been associated with Colony Collapse Disorder. 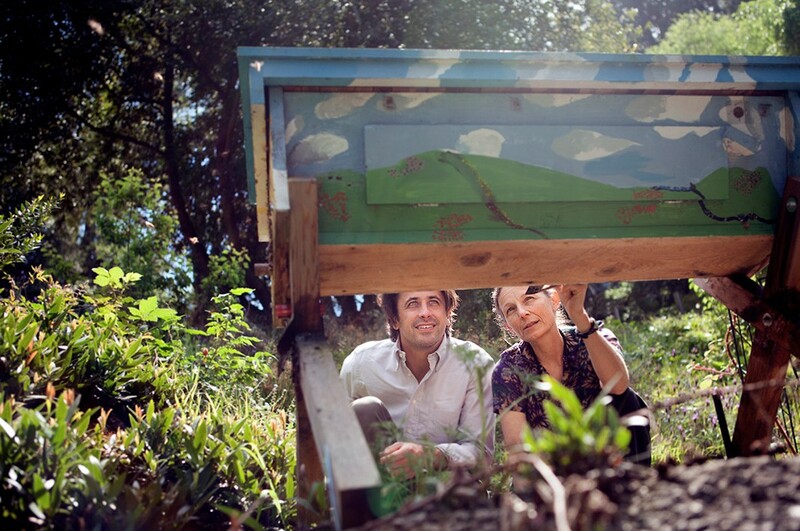 Dr. Kegley shows attorney Greg Loarie a bee box in the backyard of her home in California. Justin and Tori Engelhardt of Iowa’s Wild Hill Honey discovered the smashed beehives on Thursday, December 28, when they went out in the morning to check on the bees. All 50 of their hives had been smashed to pieces. The bees, unable to survive the cold temperatures outside the hive, were piled dead in the snow. Justin Engelhardt said nothing was stolen except for the security camera. At the time, Engelhardt said the destruction had probably destroyed Wild Hill Honey completely, because insurers don’t offer beehive insurance and the business couldn’t absorb the approximately $50,000 worth of damage that had been done. Since news of the vandalism got out, however, Go Fund Me efforts on Wild Hill Honey’s behalf have raised more than $35,000. Engelhardt posted to the company’s Facebook page that the money would allow them to rebuild and start operating again in the spring. Contamination rates are highest in North America, with 86 percent of samples containing one or more neonicotinoid, followed by Asia at 80 percent and Europe at 79 percent. The lowest was South America at 57 percent. All but two samples showed contamination levels below the “maximum residue level” allowed for human consumption under European Union laws.